Why do people make fractal art? Well, actually they don’t make it so much as they find it, steal it, dig it out of the dirt. 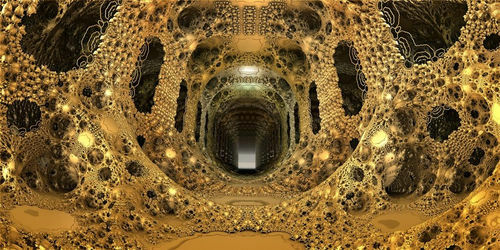 Some of the best pieces of fractal art are things just picked up off the floor of the gold mine. The fractal miners don’t call them art. They don’t call them anything. They’re named by where they were found or with a date. 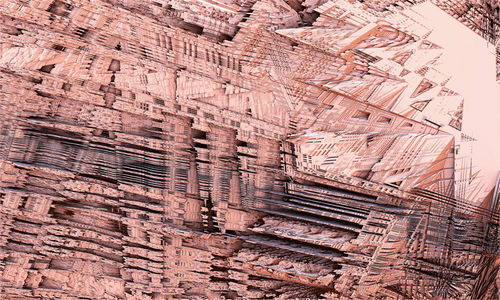 Fractal art is warehouse full of rocks and boxes of rocks. Seen as “test renders” many of the really interesting fractal works are known by just a few because they never make it out of the goldmine and into the bigger world. 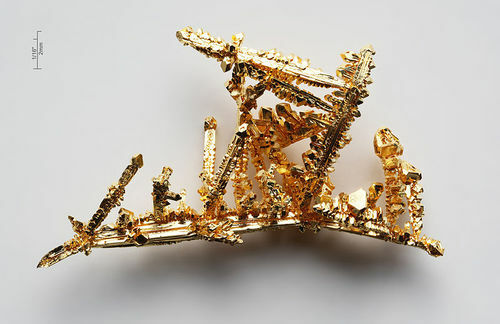 The “miners” have just seen too much gold to realize how valuable their finds really are and how much they shine when compared to the artificial stuff that clutters the big cities of fractaland. Although none of it is worth anything they keep going back to look for more. If that’s not a good description of gold fever I don’t know what is. 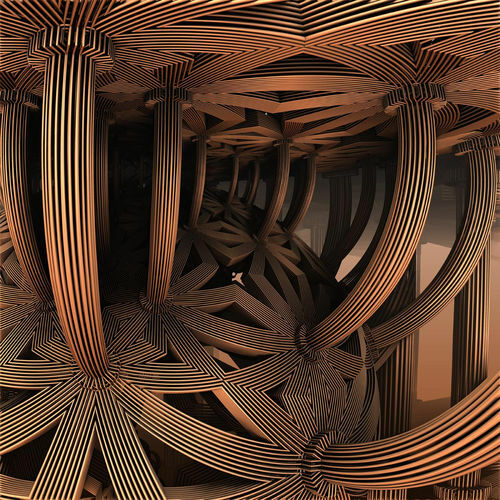 Made way, way back in April of 2011 in Mandelbulb 3D this was a single render, meaning (I guess) it comes from a single image and not a series of layers. When you find a nugget like this you don’t try to fit it into the usual 4:3 or 16:9 frame, you let it have its own aspect ratio. You’ll need to take a look at bib’s treasure map if you want to find another one like this. These folks are so low-key. 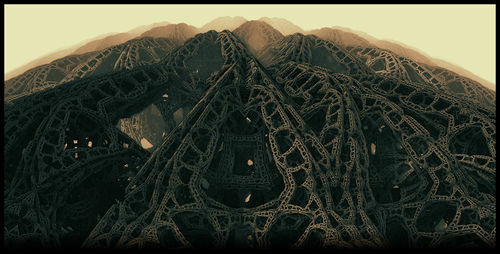 This is an awesome 3D fractal rendering that would make a spectacular poster: “Fractal Mt. Kilimanjaro” or “Eiffel Tower of Babylon”. HPDZ is High Precision Deep Zoom which (as you may have guessed) is the name of a program of whom the author (I believe) is Michael Condron of hpdz.net. Not exactly cutting edge fractal art these days, but some themes like the Burning Ship (and the Phoenix formulas) just never lose their shine and this is a good reminder of that. The site is dedicated to deep zooming and contains animation downloads ranging from 7 to 739 MB (for the true enthusiast). There always seems to be something just a little new in the 3D world, but this is quite a bit new. It reminds me of the internal parts of an electric motor as well as the lobby of a very ritzy banquet hall. Haltenny is a master of the metal mandelbox and if you follow these things you undoubtedly have seen either his very steam punkish copper vats and piping or versions by other people using his (generously shared) techniques and parameters. (What is a parameter file but a fractal treasure map?) You’ll find the best ones on his Deviant Art site. This is a bit of a departure for him but he’s one of those folks who’s always looking for something new. Too glassy and brittle to be real gold but it’s still a golden one. A nice 3D scene with a figure photoshopped in. I don’t think it’s all that easy to make these scenes look big and massive. I think one has to have some skill with the lighting and fog effects otherwise the result is something microscopic rather than this Glorious Temple of Golden Glass. Is that woman standing in awe of the massive monument in front of her, or is she genuinely lost? Well, who else would find such a motherlode as this besides “covertop99agenda5” aka co99a5 aka Kevin from Jacksonville Florida. I don’t know which name to use, but I will say that he often makes very detailed renders like this one. I think these take much more time and certainly one has to also find something with worthwhile details to render. 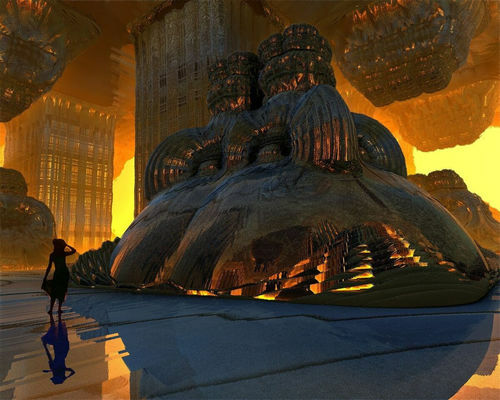 Despite numerous appearance on Fractalforums, Kevin seems to have most of his work on his Deviant Art page. Which in fact is a goldmine all it’s own. I’ve just included the most golden one here. I have no idea who this person is but their Fractalforums bio says they’re from Poland. There’s a bit of a funny story connected with this one. Trawersant apparently uploaded quite a few images via the convenient bulk upload function which is something frowned upon in many online art venues (to put it mildly). In fact I would have avoided them all if it wasn’t for the fact that this one in particular has such an interesting and unusual mandelbox folding pattern to it. 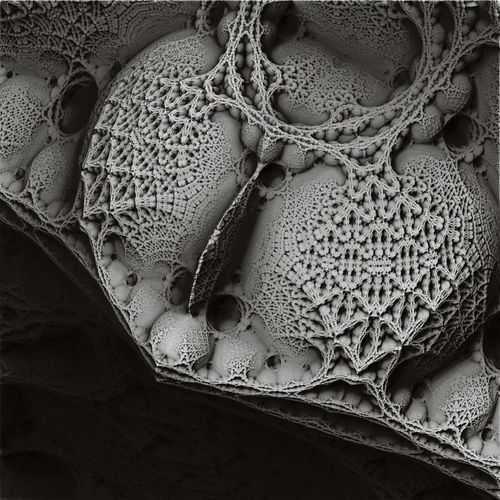 You can really see how complex and amazing the details of 3D fractals can be. No mention of which program made this one, but I’ve heard that sometimes you can’t tell those things from the final images. Paul is an oldtimer by fractalforums standards having been there since January of 2009. I believe, but I’m not sure, that his full name is Paul Derbyshire and he’s been active in the fractal world for quite some time. Paul has a different perspective on fractals which means, using my goldmine metaphor, that he tends to pick up different rocks than most of the others. The patterning and design aspects of Pauls images are quite captivating despite their humble appearance when displayed alongside the latest sculptural wonders of the mandelbox. 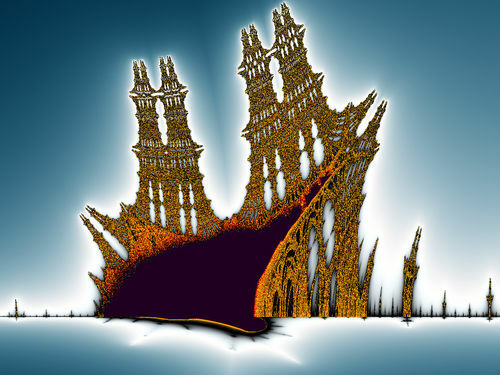 This one is a fine example but many of his other ones displayed on Fractalforums are equally good. The style is quite different but it’s still golden. In case you thought “Professor” trafassel had disappeared on his Journey to the Center of the Mandelbox I present this image to update you with his whereabouts. 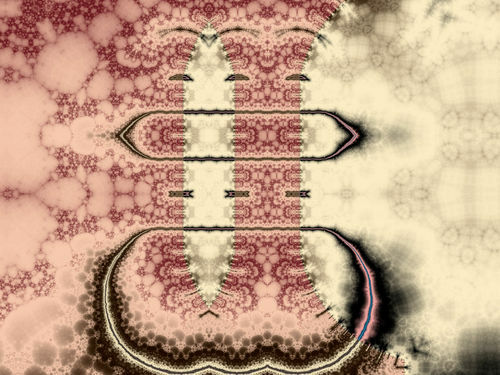 This is part of a series of images he’s made with his own program Gestaltlupe that seems to incorporate some sort of ancient dust parameter. It’s weird, but the images all seem to have accumulations of dust on them like the objects in a pharaoh’s tomb would. The result, along with the black and white, or greyscale, palette is to give a much stronger impression that one is looking at a photograph or electron micrograph. In a sense the journey is real and like other fractalists trafassel is exploring something quite tangible and in his own custom made gold mine. 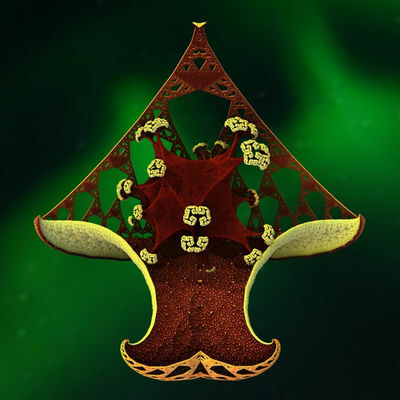 Stoni adds the note that this is his first fractal posted to fractalforums, made in the Mandelbulb 3D program. I’d say he’s (she’s?) off to a good start in this prospecting business. A great example of the varied geometric surfaces and structures that can be made. Shape is everywhere and the variations are impressive. I think it would make a very unique Christmas card. In fact, I’ve always though fractals were a natural theme for such ornamental themes as cards. Hopefully Stoni will be back (unless he’s actually another Deviant artist with a huge gallery slowly growing over there). Well, as always there’s more. And there always will be because fractals are a goldmine, or rather they are *the* goldmine. You won’t find paper money in the goldmine but you’ll find gold. It has a value all its own unlike the paper stuff that everyone chases after in the big, bright cities of fractaland.